Deathrealm - ZineWiki - the history and culture of zines, independent media and the small press. Subtitled "The Gate Where Horror Begins", Deathrealm is a literary horror zine edited by Stephen Mark Rainey. Deathrealm was published from 1987 till 1997 in Greensboro, North Carolina, U.S.A. Issues 1 through 17 were independently published by Rainey. After this it became a "semi-pro" zine and was published by Tal Publications for issues 18-22, and then by Malicious Press for issues 23-31. It featured horror fiction, poetry, artwork and columns by writers such as D.F. Lewis (Nemonymous), Roger Dale Trexler, and Karl Edward Wagner (Midnight Sun). Contributors of writing included Kevin J. Anderson, Paul Dale Anderson, Michael Arnzen, David Barker (Midnight Shambler), Donna Taylor Burgess (The Blue Lady), Cathy Buburuz (Champagne Horror), C. Darren Butler (Magic Realism, A Theater of Blood), Fred Chappell, Pam Chillemi-Yeager (Fantasque), Douglas Clegg, Mary Elizabeth Counselman, Don D'Ammassa (Mythologies), Holly Day, Douglas Doelling, Colleen Drippe, Kendall Evans, Mark Francis, Margaret Frastley, Joey Froelich, Scott E. Green, Michael Gust, K.S. Hardy, Christine Hoard (Twisted), Dwight E. Humphries, Charlee Jacob, Alex Johnson, Joy Jolly, Kathleen Jurgens (Thin Ice), Faith L. Justice, Nancy Kilpatrick, Jean Lamb, Mary Soon Lee, D.F. Lewis (Nemonymous), Thomas Ligotti, Lynda Lyons, Ian McDowell, Brian McNaughton, Billie Sue Mosiman, William F. Nolan (Rhodomagnetic Digest), Jeffrey Osier, Tom Piccirilli (Epitaph), Robert M. Price (Cthulhu Codex, Crypt of Cthulhu), Wilum Pugmire (Queer Madness), William G. Raley (After Hours), William Rassmussen, Mark Rich (Treaders of Starlight), Jessica Amanda Salmonson (Fantasy Macabre), Ed Shannon, L.S. Shevshenko, Steven Shrewsbury, David Starkey, Jeffrey Thomas, Brandon Totman, Scott Urban (Frisson), Lawrence Watt-Evans, Don Webb, Manly Wade Wellman, Noel Williams, J. N. Williamson, David Niall Wilson, Michael Zimmerman, and others. Issue # 23 featured the last known previously unpublished work of Manly Wade Wellman. Also included were interviews with authors such as Clive Barker, Poppy Z. Brite, Stephen Jones, Elizabeth Massie, William F. Nolan, Tom Piccirilli, and F. Paul Wilson. Contributors of art work included Y. Amano, Michael Apice, Cathy Buburuz, Alan M. Clarke, Richard Corben, Bob Crouch, Stacy Drumm, H.E. Fassl, Roger Gerberding, Bill Gudmundson, Lew Hartman, Charles Steven Hill, Susan Kenney, Allen Koszowski, Ian McDowell, Wayne Miller, Keith Minnion, Jamie Oberschlake, Jeffrey Osier, Kieth Peters, Ted Piwowar, J.K. Potter, Mark Rainey, Chad Savage, Julia Morgan Scott, Marge B. Simon (Star*Line), Dale Sproule (TransVersions), Marlon West, Augie Wiedemann, and Jim Zimmerman. Covers were by Michael Apice, Harry Fassl, Lew Hartman, Jeffrey Osier, Ian McDowell, Mark Rainey, and Chad Savage. 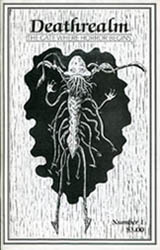 Cover art on issue #27 by Ian McDowell caused that issue to be banned in Canada, for art work that was "too disturbing", according to Lawrence Watt-Evans, writing on the Deathrealm website. This page was last modified on 15 April 2018, at 14:09.